Italy) will brighten your day. Could Personalized Medicine be the answer to the risks of immunosupression? Why so few Living Donations to Strangers in Australia? Face Transplants for blind patients? Hand Transplants for children? What do transplant team members think? Is it possible to register as a hand or face transplant donor? May 2011: A man in Florida (USA) who had recieved a kidney and liver transplant stalked his surgeon and killed him in the hospital's parking lot. Has morality just gone out the window? This is the first conviction of its kind in the UK (for violating the Human Tissue Act). The 26 year old received a 12-month suspended prison sentence. Similar story as above, a 26 year old male, arrested before the donor surgery took place. He admitted his intent to sell one of his kidneys. Transplant Tourism - a Dangerous Journey? Polcari AJ, Hugen CM, Farooq AV, Holt DR, Hou SH, Milner JE. Loyola University Stritch School of Medicine, Maywood, IL, USA. Introduction: While the ethical aspects of transplant tourism have received much attention recently, less has been written about the medical safety of this practice. We retrospectively evaluated the outcomes of patients who purchased organs internationally and presented to our center for follow-up care. Methods: Baseline demographic characteristics were recorded. Post-operative outcomes including patient survival, graft survival, five-yr graft function, and complications were assessed. Results: Eight patients who purchased international organs for transplant were identified. The country of transplant was China (n=3), Pakistan (n=3), India (n=1), and the Philippines (n=1). All patients were born in either Asia or the Middle East and traveled to the region of their ethnicity for transplantation. The mean time to presentation was 49d post-operatively. The overall one- and two-yr patient survival rates were 87% and 75%, respectively. One patient died of miliary tuberculosis and another of Acinetobacter baumanii sepsis. There was one case of newly acquired hepatitis B infection. At last follow-up, all six surviving patients had functioning grafts with a mean creatinine level of 1.26mg/dL at five yr. Conclusion: Although intermediate-term graft function is acceptable, the early morbidity and mortality among transplant tourists is high. These results suggest that the associated risks may not justify the trip. 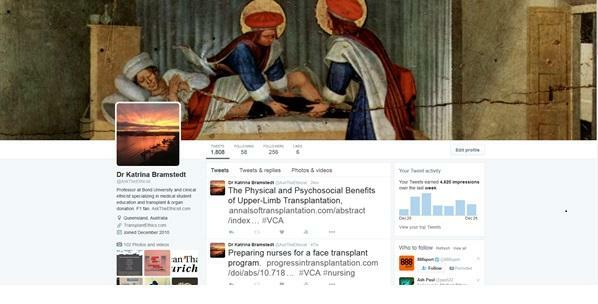 This is Professor Bramstedt's personal web site and the views expressed are her own. The site is not sponsored or supported by Bond University, Luxembourg Agency for Research Integrity, or her clients. The purpose of this web site is educational. Professor Bramstedt will NOT provide medical advice to anyone. You should consult a health care provider in all matters relating to your health, and particularly with respect to any symptoms that may require diagnosis or medical attention. Any action on your part in response to the information provided in this web site is at the reader's discretion. Readers should consult their own health care provider concerning the information on this web site. Polls on this website are opinion polls, NOT research studies. IMAGES ON THIS WEBSITE: Life Preserver - Pixabay CCO. Australian Organ Donor Card -- Katrina Bramstedt 2012 CCO. All others: no copyright infringement intended.